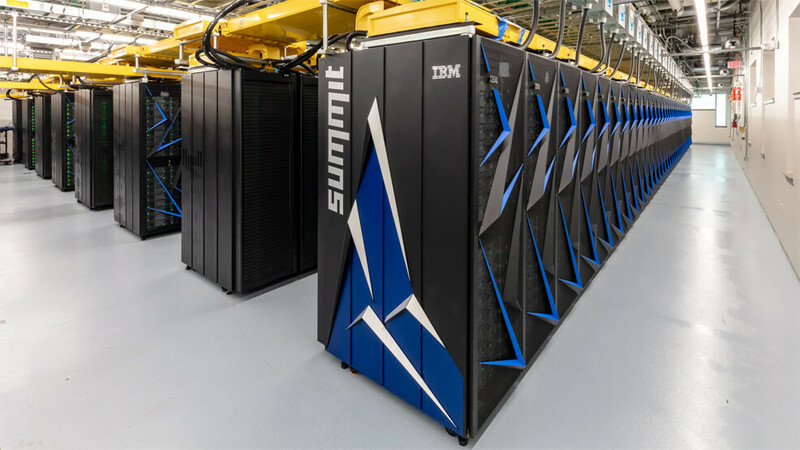 The U.S. Department of Energy's Oak Ridge National Laboratory (ORNL) has unveiled 'Summit' as the world's fastest supercomputer, with a peak performance of 200,000 trillion calculations per second, or 200 petaflops. Summit, pictured here, will be eight times more powerful than ORNL's previous top-ranked system, Titan – a nearly order-of-magnitude increase. For certain scientific applications, it will also be capable of three billion billion mixed precision calculations per second, or 3.3 exaops. Summit will offer unprecedented computing power for research in energy, advanced materials and artificial intelligence (AI), among other areas, enabling scientific discoveries that were previously impractical or impossible. Summit is 60% faster than the previous supercomputing leader, the Sunway TaihuLight in Wuxi, China. "Today's launch of the Summit supercomputer demonstrates the strength of American leadership in scientific innovation and technology development," said Energy Secretary, Rick Perry. "It's going to have a profound impact in energy research, scientific discovery, economic competitiveness and national security. I am truly excited by the potential of Summit, as it moves the nation one step closer to the goal of delivering an exascale supercomputing system by 2021. Summit will empower scientists to address a wide range of challenges, accelerate discovery, spur innovation and above all, benefit the American people." The IBM AC922 system consists of 4,608 compute servers, each containing two 22-core IBM Power9 processors and six NVIDIA Tesla V100 graphics processing unit accelerators, interconnected with dual-rail Mellanox EDR 100Gb/s InfiniBand. Summit also possesses more than 10 petabytes of memory paired with fast, high-bandwidth pathways for efficient data movement. The combination of cutting-edge hardware and robust data subsystems marks an evolution of the hybrid CPU–GPU architecture successfully pioneered by the 27-petaflops Titan in 2012. 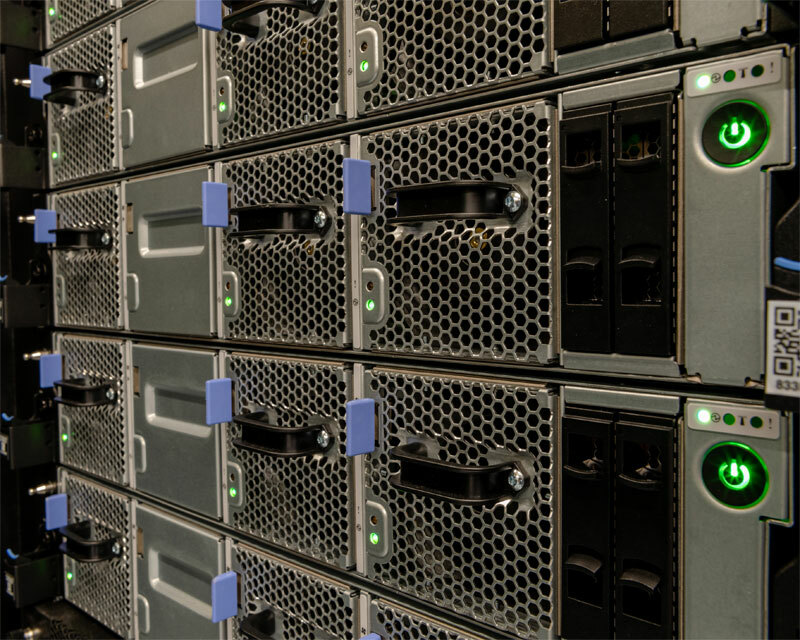 Researchers at ORNL have already used the power of Summit's state-of-the-art architecture to successfully run the world's first exascale scientific calculation. Scientists led by Dan Jacobson and Wayne Joubert leveraged the intelligence of the machine to run a 1.88 exaops comparative genomics calculation relevant to research in bioenergy and human health. The mixed precision exaops calculation produced identical results to more time-consuming 64-bit calculations previously run on Titan. "From its genesis 75 years ago, ORNL has a history and culture of solving large and difficult problems with national scope and impact," said ORNL Director Thomas Zacharia. "ORNL scientists were among the scientific teams that achieved the first gigaflops calculations in 1988, the first teraflops calculations in 1998, the first petaflops calculations in 2008 and now the first exaops calculations in 2018. The pioneering research of ORNL scientists and engineers has played a pivotal role in our nation's history and continues to shape our future. We look forward to welcoming the scientific user community to Summit as we pursue another 75 years of leadership in science." Exploding stars, known as supernovas, can supply researchers with clues related to how heavy elements – including the gold in jewellery and iron in blood – seeded the universe. Highly scalable FLASH code models this process at multiple scales, from the nuclear level to the large-scale hydrodynamics of a star's final moments. On Summit, FLASH will go much further than previously possible, simulating supernova scenarios several thousand times longer and tracking 12 times more elements than past projects. "It's at least a hundred times more computation than we've been able to do on earlier machines," said ORNL computational astrophysicist Bronson Messer. "The sheer size of Summit will allow us to make very high-resolution models." Developing the next generation of materials depends on subatomic understanding of material behaviour. QMCPACK – a quantum Monte Carlo application – simulates these interactions using first-principles calculations. Until now, researchers have only been able to simulate tens of atoms, because of QMCPACK's high computational cost. Summit, however, can support materials composed of hundreds of atoms, an order-of-magnitude jump that will aid the search for a more practical superconductor, a material that can transmit electricity with no energy loss. "Summit's large, on-node memory is very important for increasing the range of complexity in materials and physical phenomena," says Paul Kent, a staff scientist at ORNL. "Additionally, the much more powerful nodes are really going to help us extend the range of our simulations." One of the keys to combating cancer is developing tools that can automatically extract, analyse and sort existing health data to reveal previously hidden relationships between disease factors such as genes, biological markers and environment. When paired with unstructured data such as text-based reports and medical images, machine learning algorithms on Summit will supply medical researchers with a comprehensive view of the U.S. cancer population at a level of detail typically obtained only for clinical trial patients. This project is a joint initiative between the DOE and National Cancer Institute. "Essentially, we are training computers to read documents and abstract information using large volumes of data," explains ORNL researcher, Gina Tourassi. "Summit enables us to explore much more complex models in a time efficient way, so we can identify the ones that are most effective." Applying machine learning and AI to genetic and biomedical datasets offers the potential to accelerate understanding of human health and disease outcomes. Using a mix of AI techniques on Summit, researchers will be able to identify patterns in the function, cooperation and evolution of human proteins and cellular systems. These patterns can collectively give rise to clinical phenotypes, observable traits of diseases such as Alzheimer's, heart disease or addiction, and inform the drug discovery process. Through a strategic partnership project between ORNL and the U.S. Department of Veterans Affairs, researchers are combining clinical and genomic data with machine learning and Summit's advanced architecture to understand the genetic factors that contribute to conditions such as opioid addiction. "The complexity of humans as a biological system is incredible," says ORNL computational biologist, Dan Jacobson. "Summit is enabling a whole new range of science that was simply not possible before it arrived."